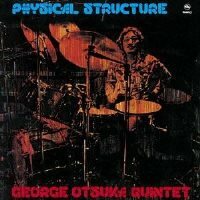 Drummer George Otsuka's (b. 1937) third leader album for Three Blind Mice featured his new quintet which included Shozo Sasaki on saxophones, Fumio Karashima on keyboards, and Norio Ohno on percussion. Recorded in 1976, the album contains four tunes and opens with the leader's original composition and title track, which is played by the quartet without Sasaki. A lyrical and flowing piece, it features the pure tone of Karashima's acoustic piano and exchanges between him and Otsuka. Various percussion instruments played by Ohno are used effectively. Other highlights include John Coltrane's "Naima" which is played at a fast tempo and features Sasaki's passionate performance on tenor sax as well as Karashima's electric piano and synthesizer. Throughout, the Otsuka lays out the base structure with his dynamic, sensitive and expansive drumming. Produced by Takeshi Fujii. Recorded at Epicurus Studio in Tokyo on February 11, 1976. Blu-spec CD is compatible with all regular CD players. Paper sleeve special limited edition.